We invite you to take an Internet trip with us to view the fifth largest Mediterranean island, land of lost civilizations, glorious beaches, impressive mountains, valleys, steep gorges, and delicious gastronomic delights. Here’s just a taste of what’s in store for you on Crete. By far the most visited and famous attraction on the Island, the magnificent Palace at Knossos is the lasting testament to Crete’s most famous residents, the ancient Minoans of the Bronze Age. Situated just South of Heraklion, Knossos remained a shadow of historic legend until the start of the 20th Century. Under the care and direction of famed archaeologist Arthur Evans in the earliest years of the 20th century, Knossos was further excavated and restored. 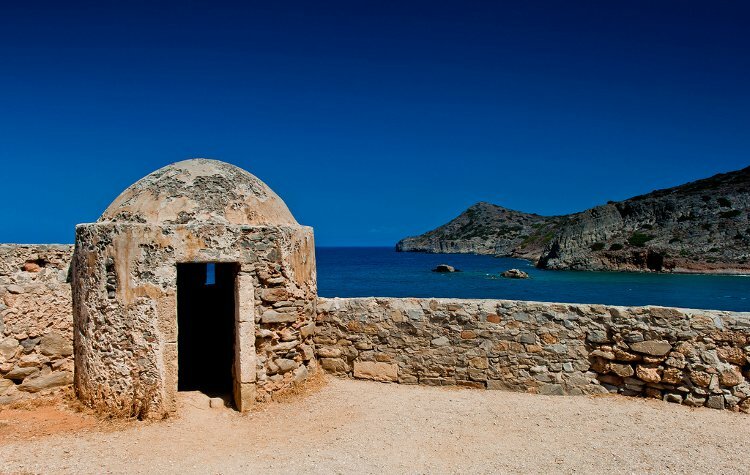 What visitors see today is a portal into a far distant time when Crete was the center of a vast maritime empire. 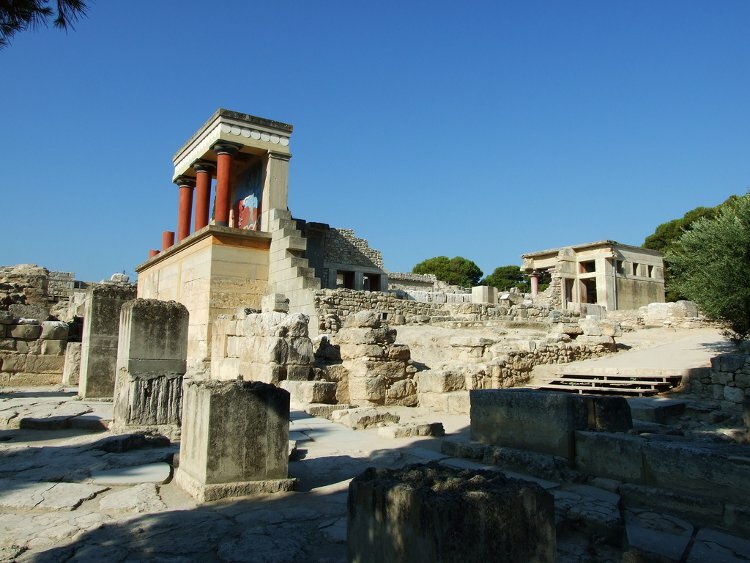 Directions: By bus, care, or cab Knossos is just 12 minutes South of the city center. The dedicated backpacker can even walk to the site in a bit over an hour, while taking in the magnificent countryside. Contact information: Call +30 2810 231940 or visit the Ministry of Culture at the website here. Crete, for millennium know for sardine fishing, makes huge deal of celebrating the catch each September. Crowds fall upon the Nea Chora Beach where seaside restaurants offer up the blessings of the sea to impatient customers. The aroma of the little seafood delicacy permeates the sea air too, as traditional music leads to cultural and modern dances all around. For enthusiasts of the Greek lifestyle, there’s not more abundantly fun exercise of such than the festival done Crete style. Grilled sardines, liters and liters of Cretan wine, and best of all the irreplaceable smiles of the locals are the attraction. Event dates – 1-10 September – Sardine festival in Nea Chora and in Souda. Directions: Less than two hours up the coast to the west of Nikos Kazantzakis Airport in Heraklion, Chania is one of the Island’s most picturesque coastal villages. Other attractions: The Naval Museum of Crete, the Archaeological Museum of Chania, Laografiko Kritiko Spiti, Hellenic Ministry of Culture, the Vizantini ke Metavizantini , and many more. For the biggest cultural events of the Summer on Crete, Heraklion is the place to visit. A plethora of events are organised each year by the city for visitors and and locals alike. The 2013 program consists of some 170 places, concerts, and a wide array of traditional Cretan events dedicated to the Centennial of Crete joining with mainland Greece. Some highlgighs upcoming in September are; dance, music, theater and cinema performances at the Nikos Kazantzakis Open-Air Theatre and the Manos Hatzidakis Open-Air Theatre, among the many other individual festival activities about town. More info: Please call the Municipality Cultural Office on Tel : +30 2810 399 211 or visit the NowHeraklion Facebook pages here. Things to see and do nearby: The Palace at Knossos (12 minutes South of airport), the Heraklion Archaeological Museum, Koules Fortress, Historical Museum of Crete, Natural History Museum of Crete, the Museum of Visual Arts, and many more attractions await. 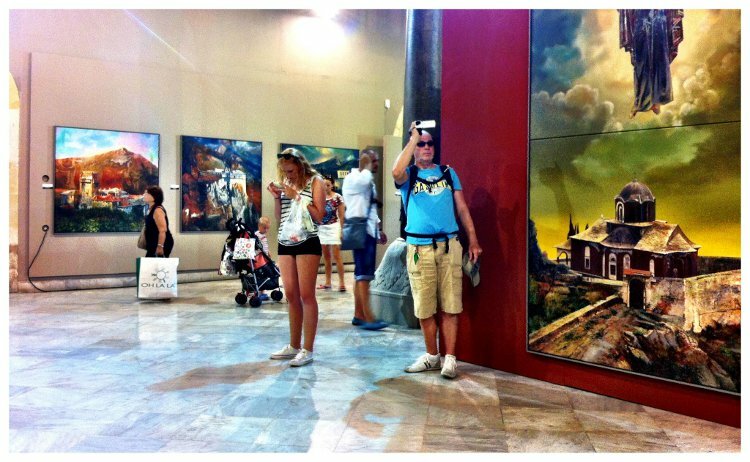 Exhibition by EFTHYMIOS WARLAMIS at St. Mark’s Basilica, Heraklion until 15th September 2013. 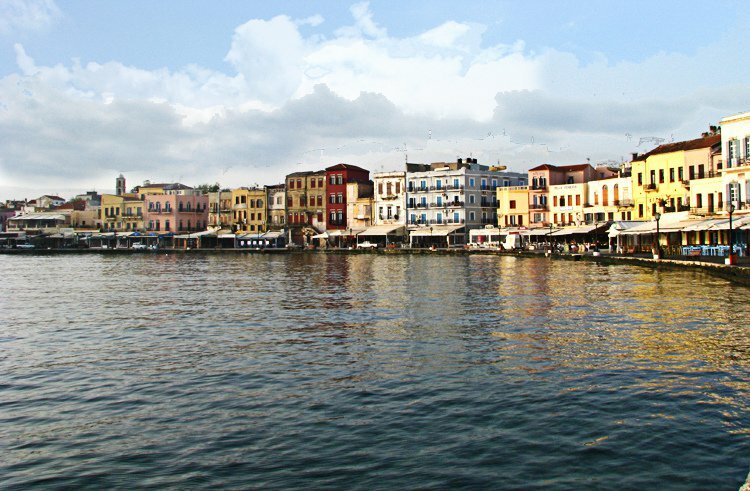 Crete is a pretty big Island, one with far too many features and attractions to list here. But for a home away from home, and a base of operations while you sightsee the Island, there’s actually pretty few clear choices for lodging. Lato Boutigue Hotel in the center of Heraklion is a “no lose” four star affair from which to explore, and to return and relax at. Among the pluses guests can experience at this fine accomodation, the unique location offer an unmatched view of the old harbor, as it literally sits atop the port ovelooking the Venetian Castle. Essentially everything in Heraklion, and all of Crete, is within two hours of this perfect stay. Guest can enjoy the hotel’s fine cuisine created under the direction of Chef Petros Kosmadakis at any of the three hotel restaurants, relax in one of the 79 rooms and suites of Lato, lavish in the steam bath hydro massage, exercise at the gym, socialize at the bar, and take in the rare brand of hospitality the hotel is noted for. Shopping, sightseeing, nightlife, and all Heraklion’s best surround the hotel. Contacts: Information and reservations at +30 2810228103 Address, Lato Boutique Hotel 15 Epimenidou Street 71202 Heraklion, Crete, Greece – and their Facebook profile is here. Price Ranges: Many long stay and weekend packages, but in general room-suite prices range from about €85 euro to about €145 euro per night. The off season represents the best bargains when in January the Executive Suite for a weekend is less than €250 total. 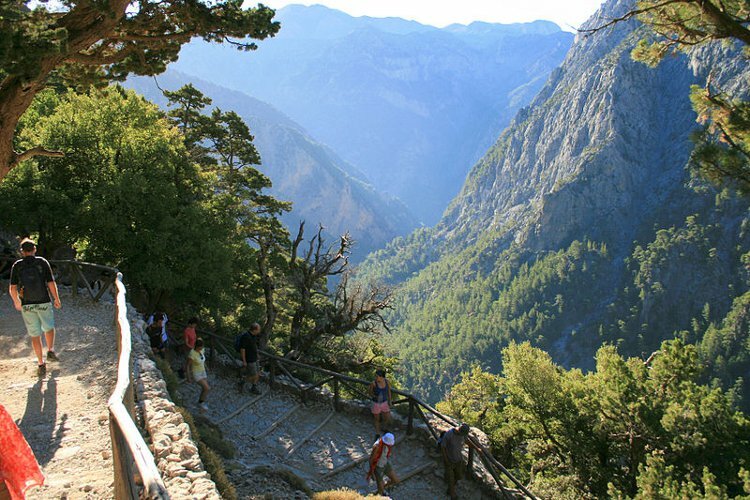 Of all the natural wonders of Crete, none is more exhilarating or beautiful than this outdoors wonderland. The gorge is a Garden of Eden of flora and fauna, a A 16 kilometer nature walk and trek to the South and West of the Island in the prefecture of Chania. The gorge, one of the largest in all Europe, offers spectacular views like the one you see below. Directions: From downtown Chania drive Drive 42.5 km, or 1 h 12 min south to the National park called Xyloskalo. The best bet it to take the buses, marked “OMALOS”, which depart Chania Central Bus Station at 07:45. Expect to pay about €14.50 for the round trip fare per person. The Eastern part of Crete is comprised of Lasithi Prefecture to the North of which the Cretan Sea gently washes ashore. To the East the ancient port of Sitia and newer Minoan finds lead to the the beautiful Carpathian Sea at the far tip of the Island. 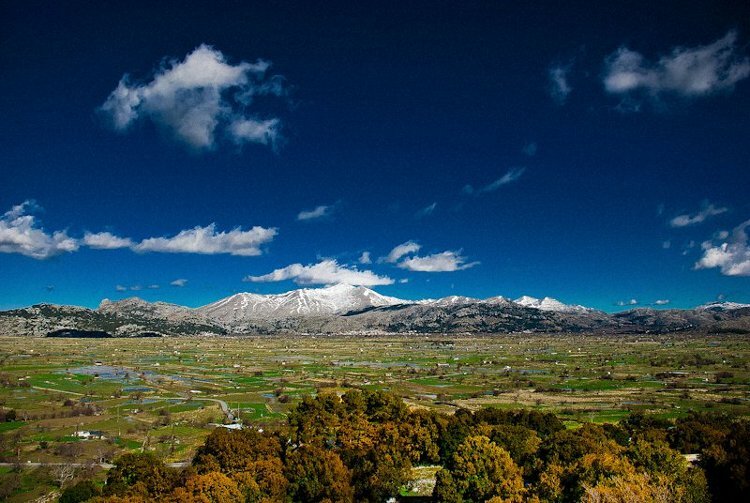 To the South, the Libyan Sea and the wonderful towns of Ierapetra,the great Agioi Saranta park, and other wonders await. This part of Cete is an environmental gem as well as one of history and lore. Outdoors types will find the Dionysades Islands, the Vai Palm Forest, and the awe inspiring Richtis Gorge and waterfall. By far the most famous attraction in this part of Certe are the windmills of the Lassithi Plateau, which most have seen in films and in travel or geography books. This is the wildest part of Crete, the part closest to nature, closest to who Cretans are some say. Directions: Just an hour or so from Heraklion’s city center, Lessithi is easily accessible by rental car, or bus on scenic E75. Other key attractions: Many in an around the cities of; Áyios Nikólaos, Ierápetra, Sitía and Neápoli. Crete food is unbelievable. And for the best traditional dishes with a gourmet tilt, the wonderful ambiance of AVLI is set by its picturesque bougainvillaea-shaded courtyard. 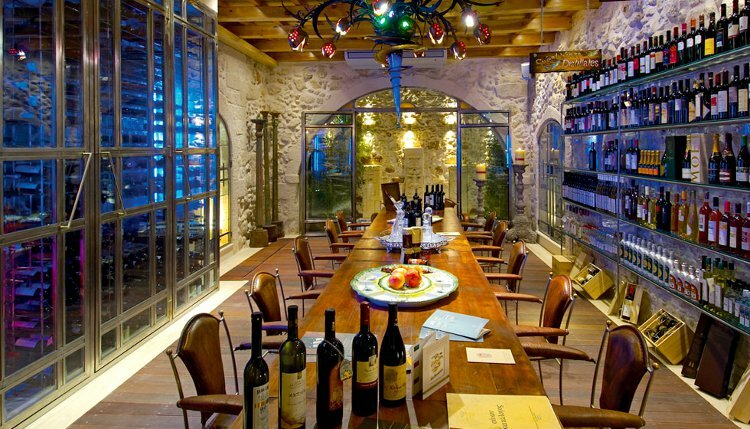 The restaurant not only serves award winning cuisine, but the establishment also boasts of one of the Island’s finest wine cellars as well. The seafood here is a treat to remember, as are the house’s famous greens and other vegetables. 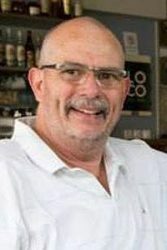 The simple take on AVLI food and service is that Chef Aristea Dafnomili has become a local legend and is more and more known from guests spreading the good news of this fabulous Crete cuisine. Expect to be treated as family, and to dine like Minoan royalty. 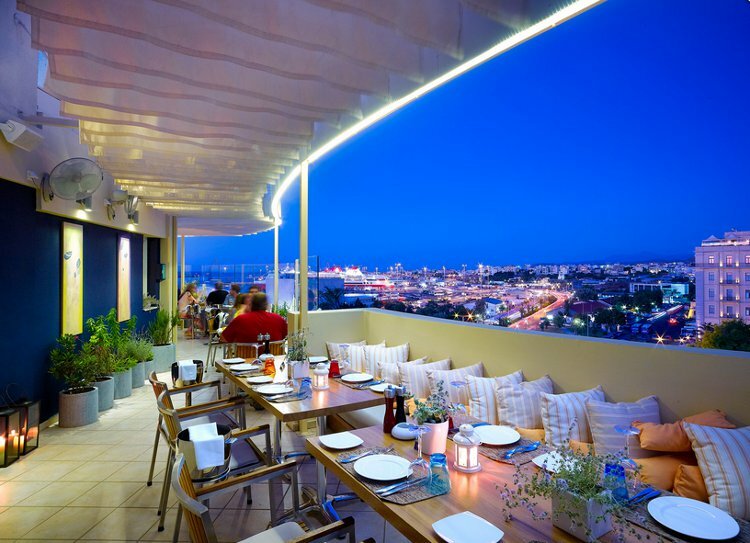 This restaurant is one must Crete culinary journey. 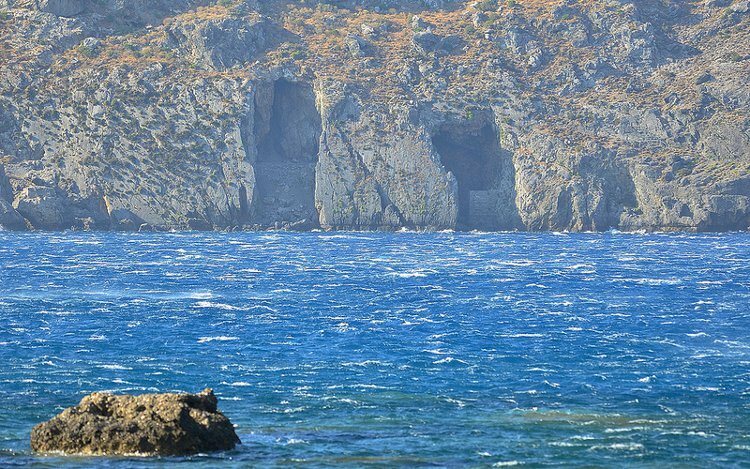 This magnificent and untamed Island at the far East tip of Crete is another Cretan point of interest. The Island is officially known as Kalydon and is situated in the gulf of Elounda. Back when, Spinalonga was actually a part connected to the main Island of Crete. The Venetians took salt from the mines here, and the Island was once even used as a leper colony early in the 20th century. Fortified to protect the ancient city of Olous, which now lays sunken and super mysterious, an undersea attraction once linked economically with the Minoans at Knossos and the Island of Rhodes. Beside the fort and old leper colony here, the big attractions are the wonderful pebble beaches and the shallow, clear waters surrounding the Island. Directions: The Island is accessible by bout tour, it is only a little over a kilometer outside of Elounda. Special notes: Day trips to the Island from Elounda and Agios Nikolaos are the preferred means of sightseeing and visitation for the Island. 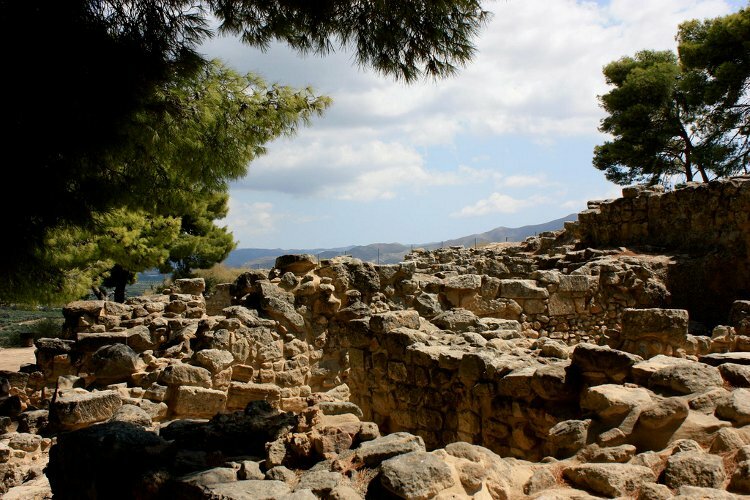 Situated in South central Crete, the ruins of this Bronze Age city are still the source of much wonderment and study about the Minoans and even earlier occupants who lived here. Inhabited since as far back as 4000 BCE, Phaistos was destroyed in the great earthquake of the late Bronze period, but later rebuilt and destroyed again by the invading Achaeans. Phaistos is often associated with the mythical king of Crete Rhadamanthys. The vast palace complex here offers spectacular views of the surrounding Cretan landscape. One can almost feel the presence of those ancient Crete ancestors who surveyed a beautiful agrarian countryside that supported the Minoan culture so many eons ago. Directions: The Phaistos site is situated just over an hour drive South of Heraklion not far from the little village of Skourvoula and the dam of the same name. Known as much for the great diving attractions as for the resort hotels and beaches nearby, this bay in the South and West of Crete is something of a hidden gem for most Crete visitors. Beneath the waves divers will find a caves and tunnels filled with wonderful sea life including; groupers, morays, starfish, shrimps and colourful sponges. Above the Libyan Sea, Skinaria Bay boasts some of Crete’s best stretches of populated and isolated beaches, most notably in the former fishing village of Plakias. For a bit more remoteness, with a hint of resort vacationing glee, this area of Crete is a fairly untouched experience, with local flavor. Directions: An hour and a half drive from Heraklion, and 40 minutes South of Rethymno, Plakias is one of the more isolated Cretan towns, but easily accessible by car or bus.